A few years ago, Ankur and I, both were avid Himalayan trekkers. Standing at the foothills of a Himalyan peak is a humbling experience. One tends to feel puny in front of Nature’s grandeur. A similar feeling overwhelmed us when we ‘got introduced’ to the Vatnajokull glacier… a feeling of being an insignificant nothing in the bigger scheme of things. Have you ever felt that way…. like a tiny speck in the vastness of the Universe? The entire set up makes me drift into a philosophical mood! What’s all the fuss about Vatnajokull Glacier? The Vatnajokull Glacier is the largest glacier in Europe. It’s a vast expanse of crystal blue ice that occupies ~8,100 square km and covers almost 13% of Iceland’s total surface area. If you are expecting it to look like a sheet of ice, you are grossly mistaken! 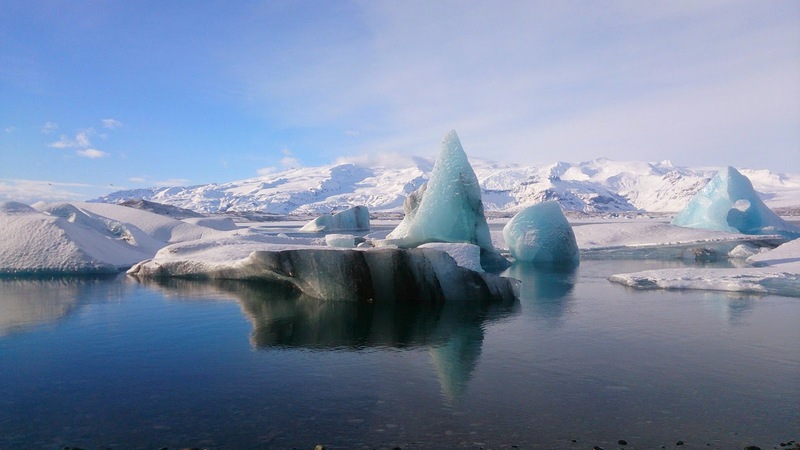 Vatnajokull is a frozen mass of water that has an average thickness of about 400 meters. The thickest points are about 1000 meters… that literally means a sheet of ice that is 1 kilo meter thick. There are cracks and crevices that run through the surface of the glacier… some are a few feet deep and others a few hundred meters deep. 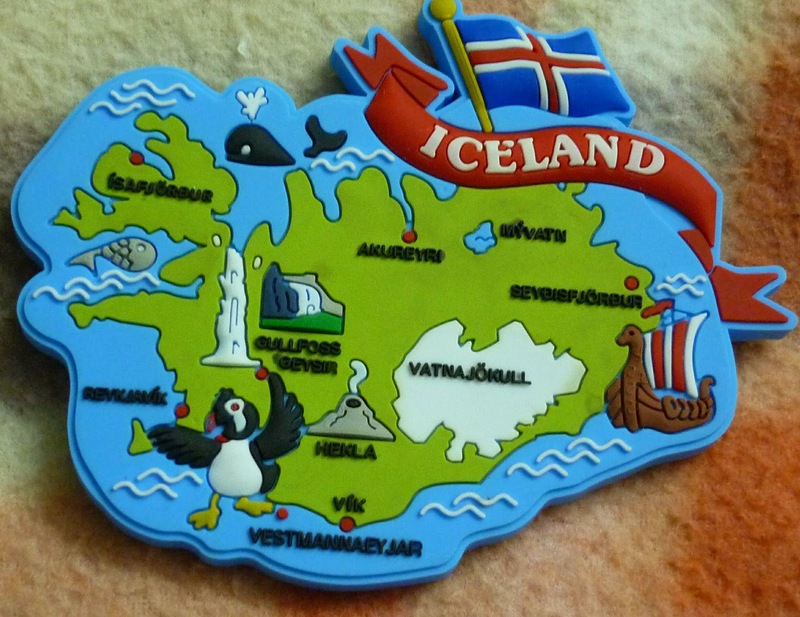 Our fridge magnet has Vatnajokull too! There are tunnels and caves that run through the ice mass. The ice cap has about 30 outlet glaciers. Oh… I almost forgot to mention – the Vatnajokull Glacier has volcanoes bubbling under. Does it challenge your imagination… at least a little? Strange are Nature’s ways… fire and ice exist at the same place… and yet we think that they are poles apart! Why does glacial ice appear blue? Glacial ice is blue… crystal blue… as though someone as infused ink into the water that now stands frozen. The layer of white snow, which is the topmost layer occurs on account of sunlight and exposure to weather conditions. The glacial ice is typically hundreds and thousands of years old. The high pressure of water and ice itself forces air in the ice crystals to form tiny bubbles and eventually forces out these bubbles as well. The ice crystals become larger and more compact and develop the crystalline blue appearance. 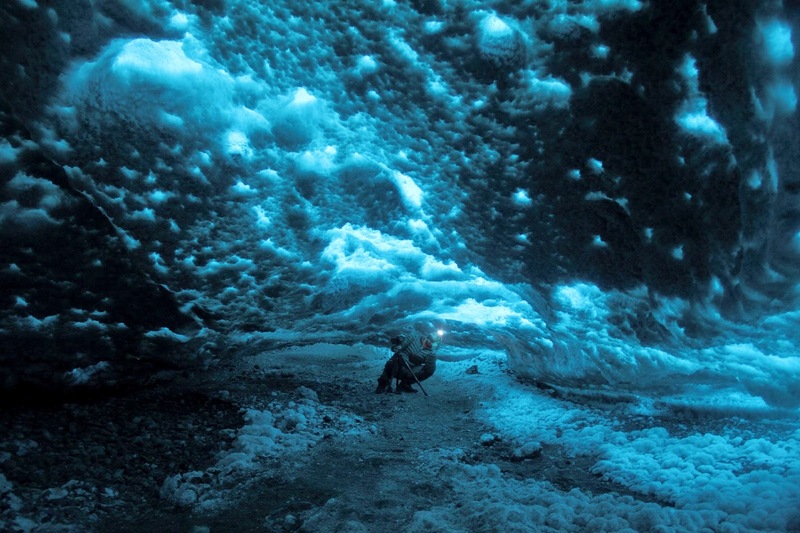 What’s ‘Ice Caving’ all about? What’s the ‘Glacier Walk’ all about? Well, it’s about walking on the glacier…that’s what its all about! 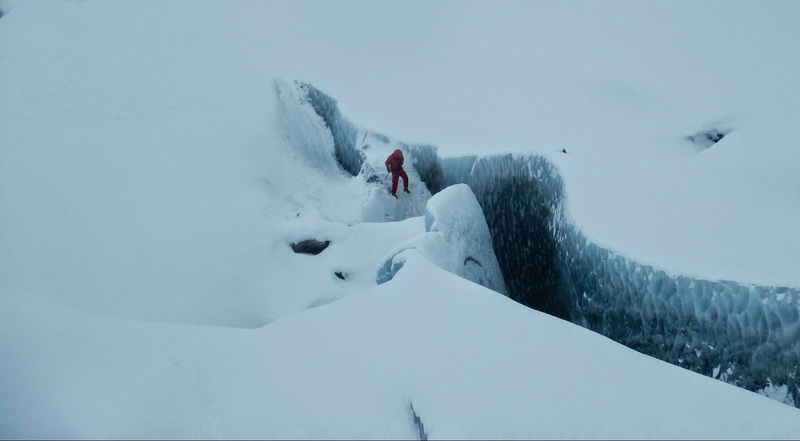 Walking on smooth ice of the Vatnajokull glacier, with a powdery snow and a looming snowstorm pumped up our adrenalin. More adventure than our capabilty? Nah… bring it on!Crampons safely secured to our boots, we ditched our DSLR for this walk and took a point and shoot along. We wanted to soak in as much as we could. 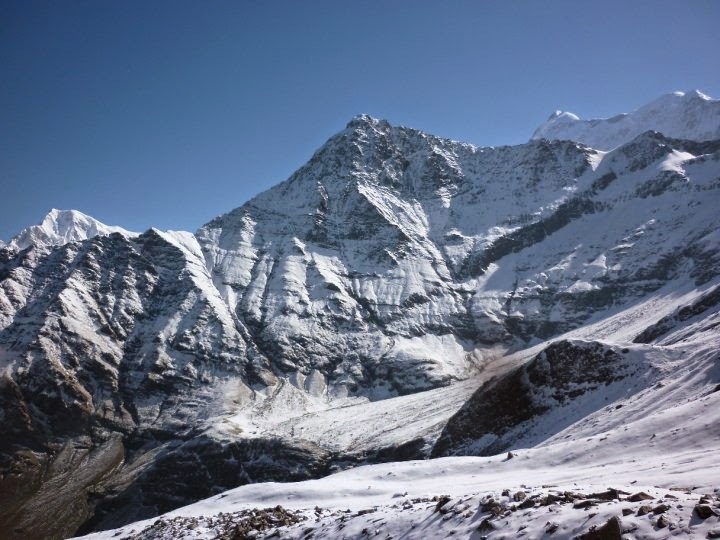 The landscape was lovely – the blue glacial crevices… white expanse of snow… sloping mountain peaks. We trudged along in a line…like ants walking on a sand dune! Amongst the most memorable two hours that we spent in Iceland! Do not miss the Vatnajokull glacier and related activities if you are in Iceland… they are worth every penny and every second spent! We did the South coast, ice cave and glacier walk tour with Extreme Iceland. 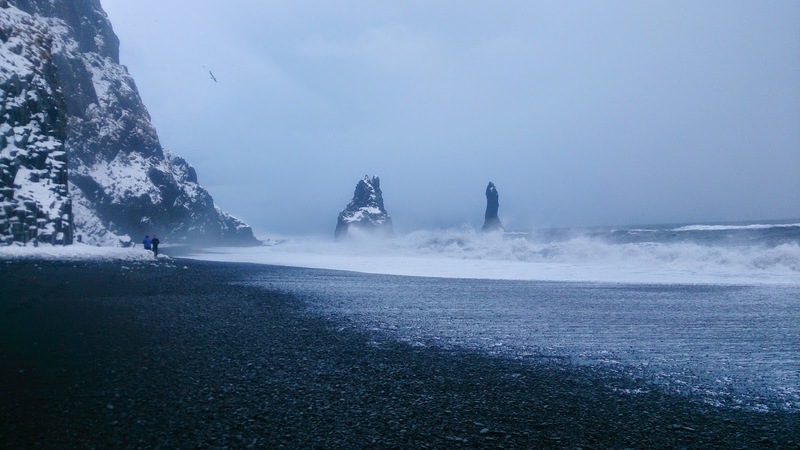 It was a three day – two night trip that took us to major sites like the black sand beach at Vik, Jokulsarlon glacial lagoon and plenty of waterfalls. All we did was… paid Extreme Iceland. They took care of the rest… pick up, drop off, guide, transportaction, equipment, etc… Everything except cost of the drinks and meals was included! Hi! Thanks for all the great info about your Iceland visit, it seems so fun! I’ll be going in December and I’m looking into the 3 day, 2 night South coast, ice cave and glacier walk tour with Extreme Iceland that you did, but on their website, they mention that it also includes the golden circle and northern lights chasing. Will I be missing out if I don’t book a separate golden circle tour like you guys did? And a separate NL tour? I found your blog via Google and love your itinerary and was going to do basically the same thing, but I also don’t want to visit the same places twice in the same trip! But then, I also don’t want to miss out on anything either… Any advise is greatly appreciated! Hi Emmy! Glad that the blog could be of help. When we went, Extreme Iceland never offered the South Iceland and Golden Circle trip together. It is a new addition that they have. I have gone through their site and the trip that you are referring to. The trip covers everything that we did in two separate trips. Hence, just this one trip would suffice. In case you do not see the NL on the nights that you are with them, you can always come back to Rek and book another NL trip.